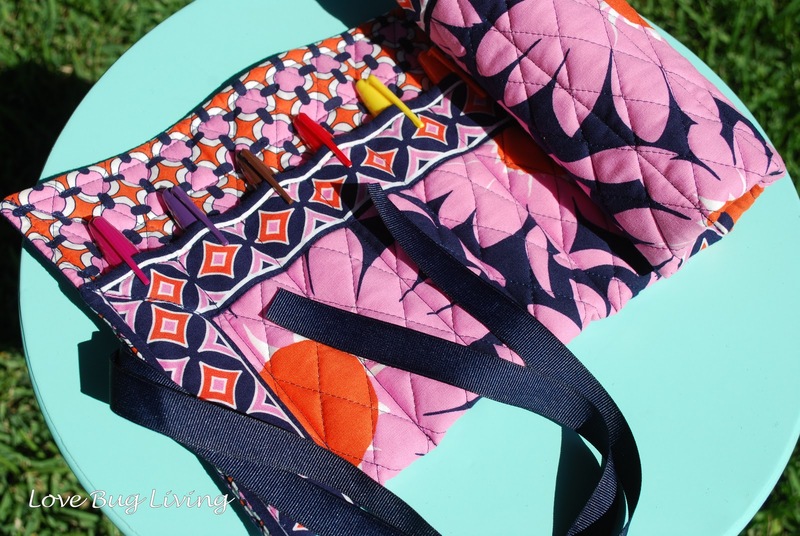 Love Bug Living: Vera Bradley Marker Rollup - Teacher Gift! Vera Bradley Marker Rollup - Teacher Gift! It's tough coming up with teacher gifts every year. You want to find something that they will use and like while avoiding those gifts that everyone gives. I try to come up with something handmade, since it is a lot less likely that it will be a duplicate gift. I've been making these marker roll ups as gifts for the last couple of years. They are so cute, useful, and easy to make! 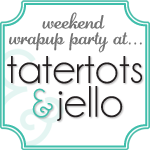 Perfect for whipping up one or more of these for the holidays or teacher appreciation day. 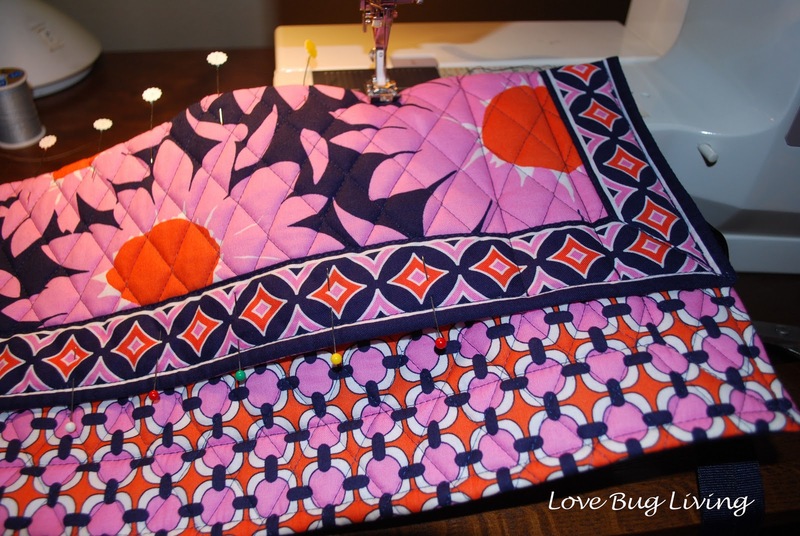 You will need a quilted placemat, matching ribbon, and your markers. I love the Vera Bradley prints with the coordinating print on the back side of the placemat. Plus you can find the placemats on sale on their website whenever they are discontinuing a print. Any placemat will work though. 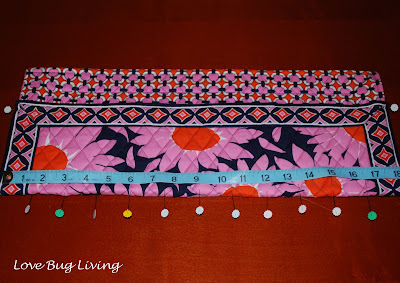 This means you will place a pin every 1.5 inches to mark where you will sew. 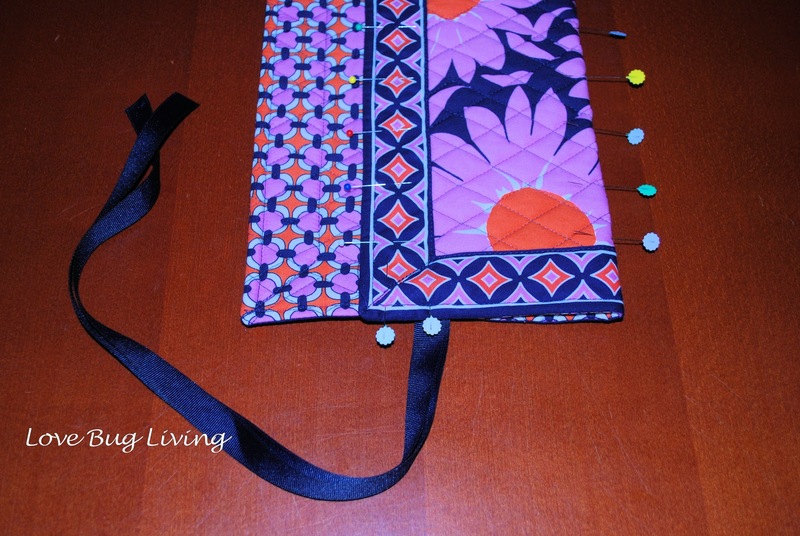 I also measured and placed pins at the top of the pockets to help me sew in a straight line. Now you will need one yard of your matching 1" ribbon. Fold it in half and slide the folded end of the ribbon into one side of your folded edge. Pin it in place. Now it is time to sew! Start at one end, sewing up the edge, backstitching. 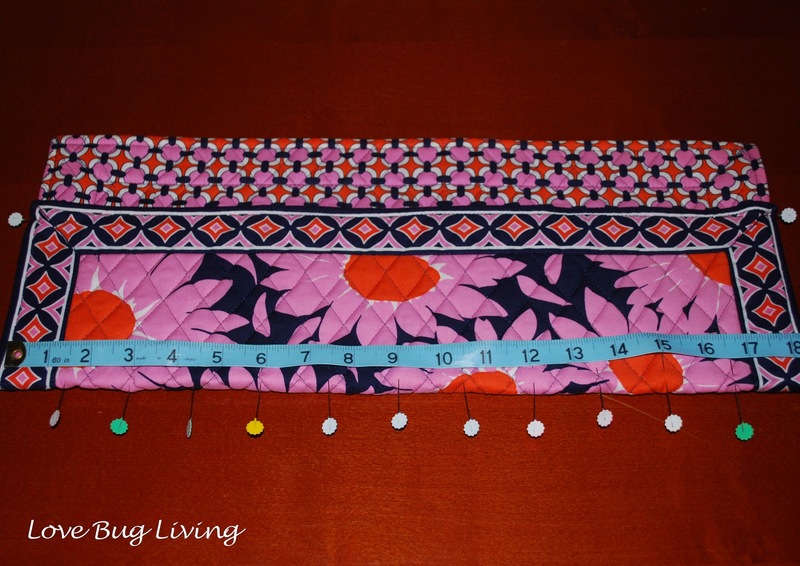 You may also want to backstitch over the ribbon to give it a little extra support. Now continue to sew a seam at each pin, starting at the bottom and sewing up to the top of the pocket. Trim your threads. You may also singe your ribbon edges to keep them from raveling. Now just roll it up and tie your ribbons around to close. 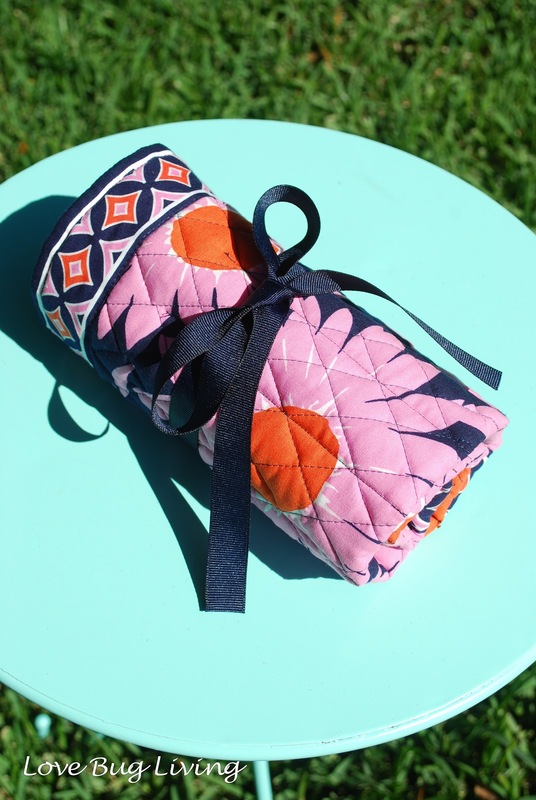 These rollups can also be made to hold knitting needles, colored pencils, or make a wide pocket in the middle to hold a pad of paper! Perfect for the kid on the go! I will sooooo be amking one of these for MC's teacher!!! 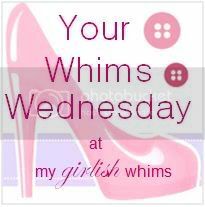 THANKS for stopping by my blog!!!! Wow! I love that you made this with a placemat. I am totally making some of these. Thanks. I made something along these lines for the kids and they loved them. Never thought of making them for the teachers- thanks for the idea! That is so fantastic! What a great idea! That would be nice to take on trips. I was wondering where you got the Vera fabric...neat idea to use the placemats! I didn't even know she made placemats...lol. Thanks for linking! Vera also has cloth napkins that are great to use for projects as well! These would make cute makeup brush rolls. Also knitting needle or crochet hook rolls, although with knitting needles, you would make smaller pockets at the beginning for smaller needles and increase the size for bigger needles. You have such cute ideas! Thanks! I've also made them for girls gifts with colored pencils along with a doodle pad.